Get ready for a insect filled adventure. Ms. Frizzle along with her science-curious class are at it again, but this time to help find their long lost bugs. A terrible mishap occured with the kids' terrariums - each is missing one of its bugs. Climb aboard the Magic School Bus to help Ms. Frizzle and has class find them. Then, get ready to shrink down to wee bug size and explore the wild world of bugs. Familiarize yourself with the characters' bug projects (and learning the difference between insects, arachnids, and other bug relatives). Visit the four different habitats of the missing bugs (pond, jungle, forest, and meadow). In each habitat, numerous bugs can be found, and by clicking on one, the player can receive an informative description of that bug from one of the characters. Each habitat is home to one of the missing bugs, and the teacher provides the player with clues as to that bugs identity. Once the player has identified the bug, he or she can use the net to catch it and return it to its home in the classroom. Upon completion of the mission, the player can opt to continue exploring or to start the adventure over with new bugs to find. In this way, the game can be played many times. Aside from the multitude of interesting bugs that can be examined, this game is interactive and entertaining on many fronts. The classroom is full of objects that can be clicked on to produce fun results, and the Magic School Bus contains many entertaining gadgets and gizmos. One of these is the game machine, which collects games encountered along the adventure. 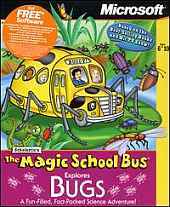 In each habitat the player can find a video game with a bug theme, and these can be collected on the Bus' game machine. The Bus also has a jukebox with familiar bug songs on it.